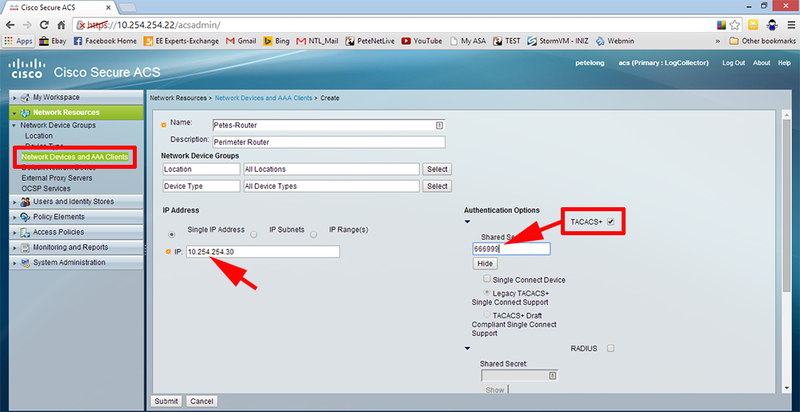 For network identification I have tended to use RADIUS (in a Windows NPS or IAS flavour), in the past. 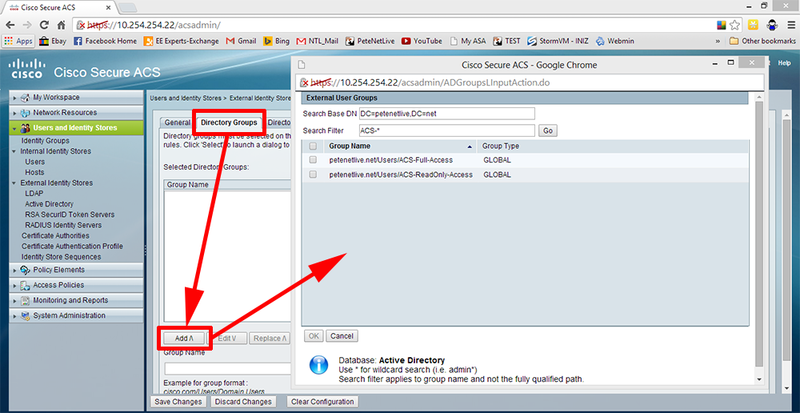 I turned my back on Cisco TACACS+ back in my ‘Studying for CCNA’ days, because back then it was clunky and awful. I have a client that will be installing ACS in the near future, so I thought I would take a look at it again, and was surprised at how much more polished it is. 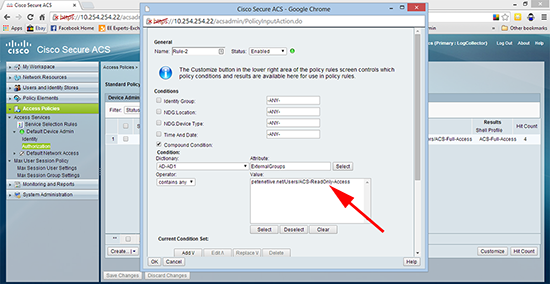 As Cisco plans to roll ACS into Cisco ISE in the future, I’m not sure if it will remain as a separate product. So we may find people using version 5 for a long time yet. I’m deploying ACS version 5.5 as a virtual appliance, remember to give it at least 60GB of hard drive or the install will fail. 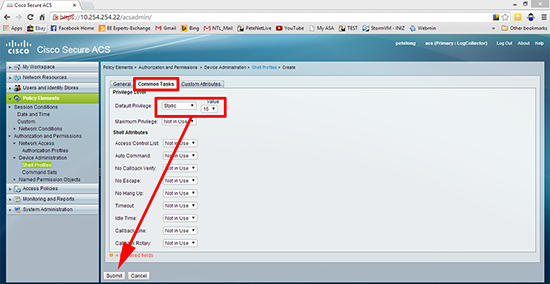 If you are installing on VMware workstation, choose the ‘I will install the operating system later’ option and manually present the CD image or it will also fail. NTP Server IP address. 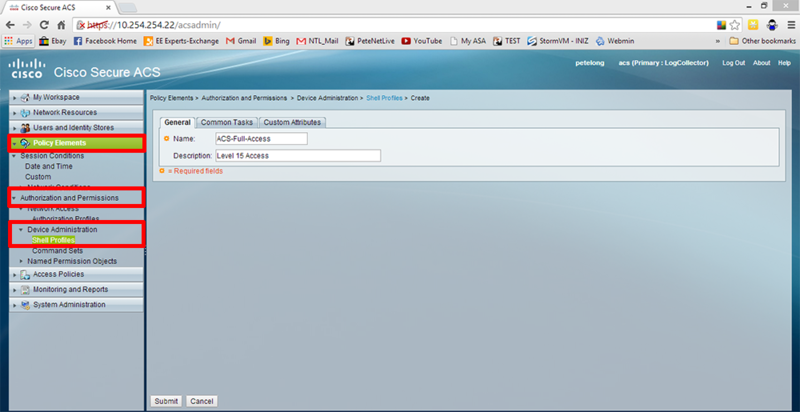 (Ensure UDP port 123 is open or this will fail). 1. 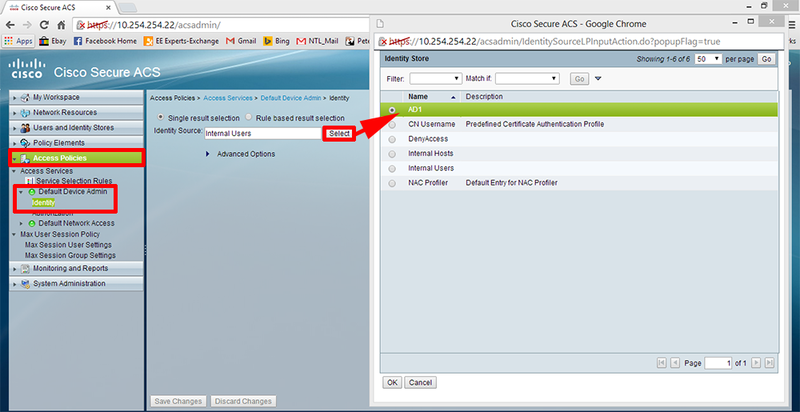 Join the ACS appliance to your domain. 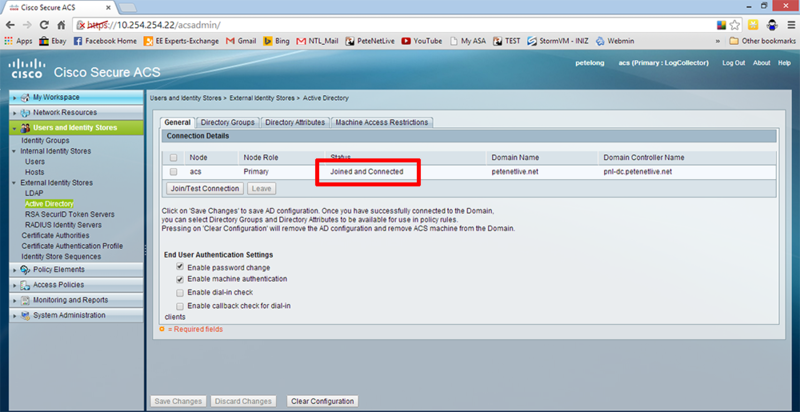 Users and Identity Stores > External Identity Stores > Active Directory > Join/Test Connection > Enter Domain Credentials > Join. 2. 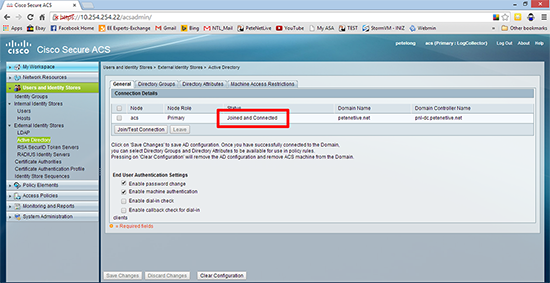 Be patient it can take a couple of minutes, wait till it says ‘Joined and Connected’. 3. 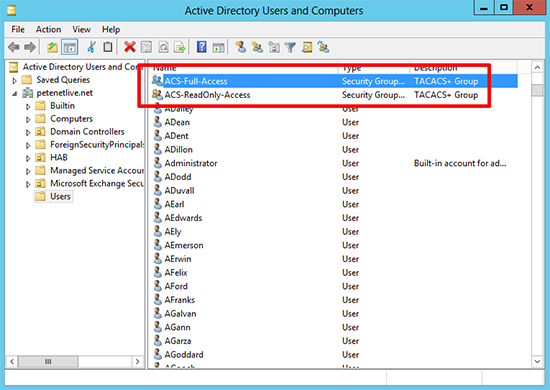 Make sure you already have some groups in active directory that you want to grant access to, here I’ve got a full-access group and a read-only access group. Note: I’m going to grant privilege level 15 to full-access, and privilege level 1 to read-only, (yes I know they can still escalate to configure terminal mode, but you can always restrict level 1 so it can only use the show command if you like). 4. Back in ACS > Directory Groups > Add > Add in your Groups > OK.
5. 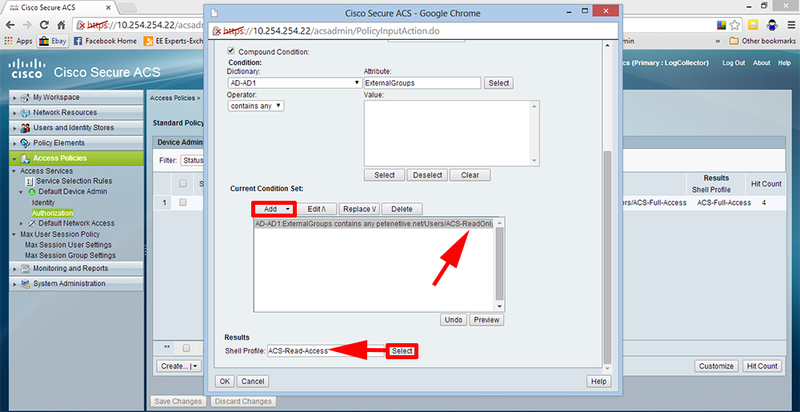 Create a Shell Policy: Policy Elements > Authorization and Permissions > Shell Profiles > Create > First create one for level 15 (full-access). 6. Common Tasks tab > Default Privilege > Static > 15 > Submit. 7. 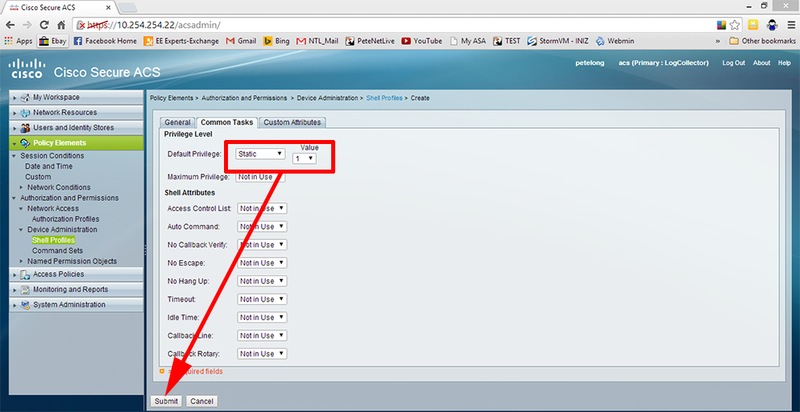 Then repeat to create a profile for read-only (level 1) access. 8. Common Tasks tab > Default Privilege > Static > 1 > Submit. 9. Access Policies > Access Services > Default Device Admin > Identity >Select > AD1 (this got created when you joined the domain earlier) > OK.
10. 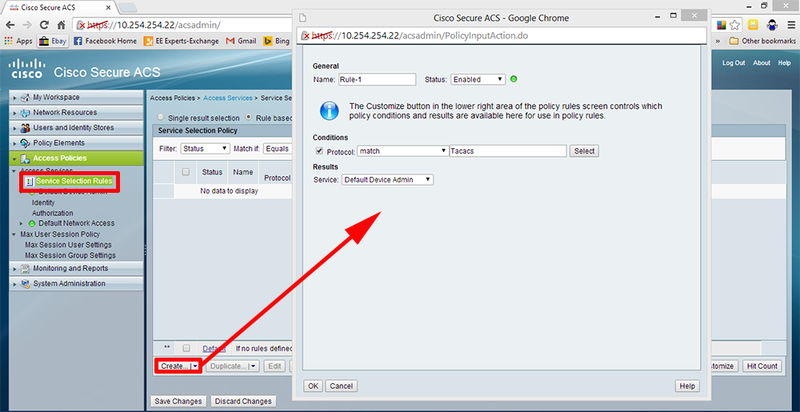 Access Policies > Access Services > Default Device Admin > Authorisation > Customise > Add ‘Compound Condition’ > OK.
11. Create > Tick ‘Compound Condition’ > Select > ExternalGroups > Select your full-access group. 12. 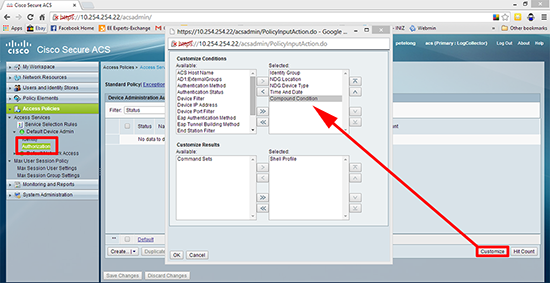 Add > Shell Profile > Select > Select the full-access profile > OK.
13. Repeat for the read-only group. 14. Set the shell profile to read-only access > OK.
15. 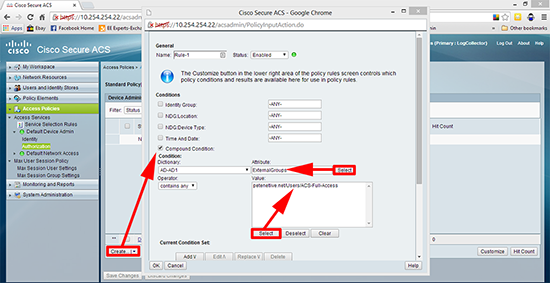 Access Policies > Service Selection Rules > Create > Set to Match Protocol TACACS > Set the service to Default Device Admin > OK.
16. Network Resources > Network Devices and AAA Clients > Enter the details of your Cisco device and set a shared key, (here I’m using 666999) > Submit. 18. 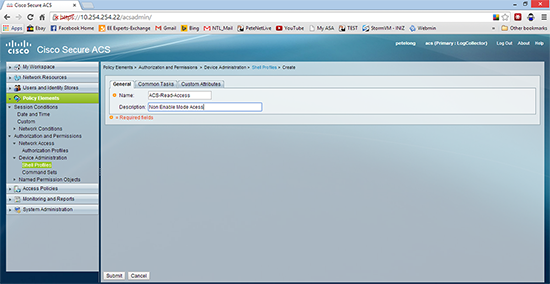 Now you can test, here I connect as a user with read-only access (Note: I have a greater than prompt, I’m in user EXEC mode). 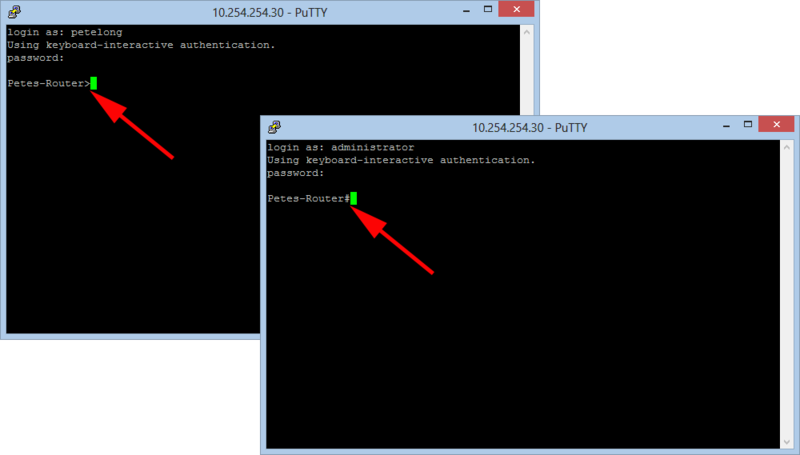 Then when I connect as a full-access user (Note: I have a hash prompt. I’m in privileged EXEC mode). 19. The results are the same if I connect via SSH. Sometimes, e.g. 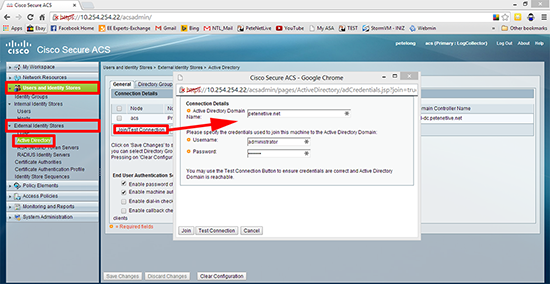 you have a switch in a DMZ or a router outside your firewall that you want to secure with TACACS. To enable this you simply need to open TCP port 49, from the device you are securing with TACACS to the ACS server.